Publicis Groupe and Alibaba Group have struck a partnership to create a new Uni Desk, which is part of Uni Marketing, Alibaba’s data-powered marketing framework. The collaboration will look to benefit clients of Publicis Media, Publicis Communications and Publicis.Sapient. According to the agency, the move also reinforces its commitment to leadership in digital, data and technology. The partnership will focus on three main areas. Firstly, Publicis Groupe and Alibaba will co-create data-enabled media planning features and functions under the Uni Desk tool suite. Both Publicis Groupe and Alibaba Uni Desk product teams will work to create and refine the product offer. This is especially in data labelling and segmentation methods, dimensions of success metrics and tracking enhancement to best serve brand marketers’ needs. This will allow Publicis Groupe to utilise Uni Desk to generate deeper consumer insights, inform content decisions and enable precision in storytelling. Next, the partnership seeks to create in-content innovation, with the support of Uni ID data infrastructure. It hopes to drive real-time data driven insights to design and inform locally relevant creative. It also looks to enable customised content journey across the Alibaba ecosystem. This includes Tmall, Taobao and beyond e-commerce into Youku, Tudou and UCWeb for Video, Gaode Map and Moji for Local Services and Momo and Sina Weibo for Social. Lastly, it will look to create “unique media and content solutions” around key occasions and events. The partnership will create marketing solutions to transform shopping occasions into meaningful life moments enabled by brand experiences. “This partnership propels our vision to create future forward capability and solutions by harnessing the power of data and technology for brand growth via data enabled precision storytelling and brand operations for our clients. 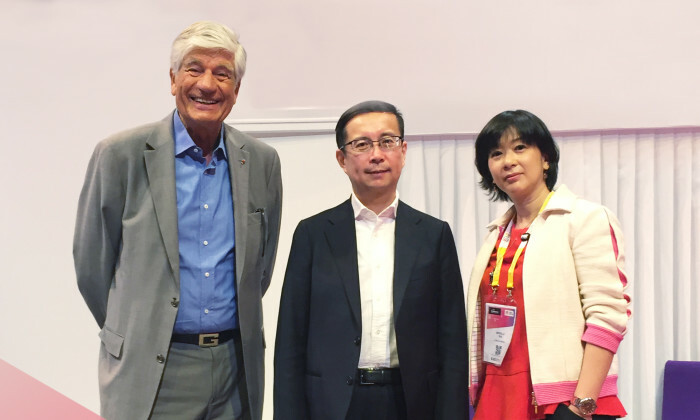 We are excited to be the pioneering agency partner to share and support this journey of growth with Alibaba,” Bertilla Teo (pictured right), Publicis Media Greater China CEO, said. “Alibaba Group has embraced a journey of transformation from e-commerce platform to a big data company that aims to create quality life for Chinese and global consumers with the convergence of commerce, content and technology, enabled by Uni Marketing capabilities. We are committed to forging a strong and special partnership with Publicis Groupe to develop the Uni Marketing product,” Chris Tung, chief marketing officer, Alibaba Group, said. Blogapalooza, the Philippines’ premier business-to-blogger network and marketing event, recently held its highly anticipated conve..
"We don’t see ourselves as a brick and mortar retailer. We see ourselves as a company that’s obsessed about the customers and tryi..